It is a tool for splitting an MP3 file into smaller ones. 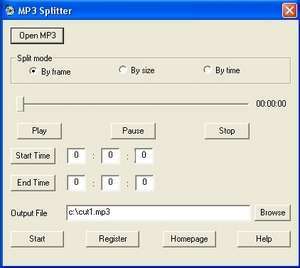 You can pre-listen the MP3 file, set start time and end time, split or cut any section of the MP3 file. It also splits equal parts either by size or by time. For security reasons, you should also check out the MP3 Splitter download at LO4D.com which includes virus and malware tests. Additional screenshots of this application download may be available, too.